Before we had kids, there would sometimes be nights when J would have a work event or a night with the guys and I would be on my own for dinner. This is never a problem for a gal who likes to eat everything and happens to be married to a seriously picky eater (although I did miss his company, of course!). Some nights I’d make myself fancier, more involved entrees. But on many nights I really enjoyed keeping it simple. 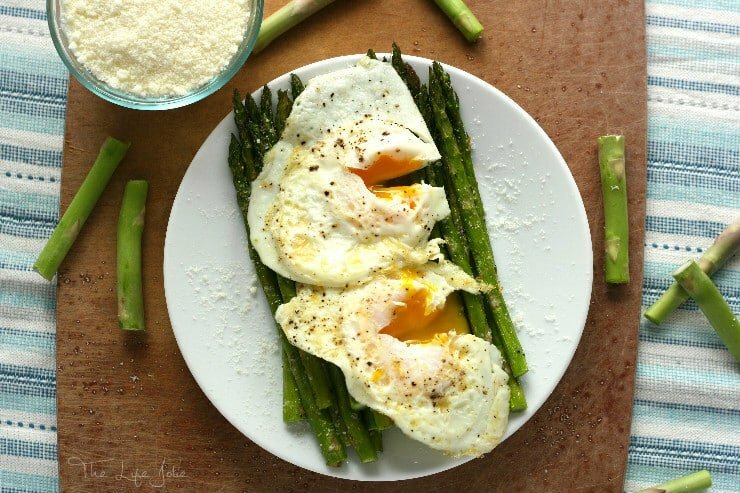 This Parmesan Roasted Asparagus with Fried Eggs was frequently my go-to. 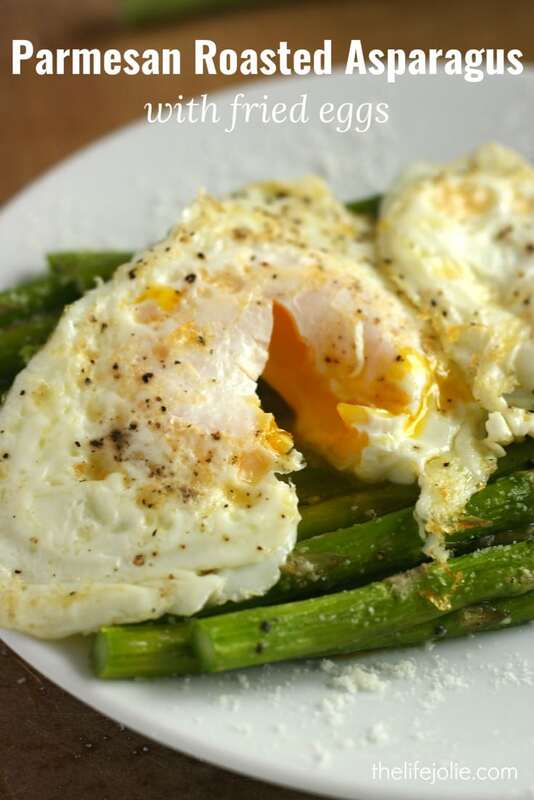 There is just something so simple yet luxurious about perfectly fried eggs served atop roasted asparagus. The Parmesan cheese (or in my case Romano, as that’s what I tend to have on hand) adds a bit of salty goodness and the runny yoke brings a decadence that elevates the entire dish. 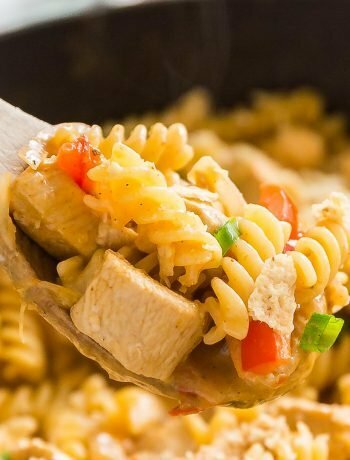 I usually make this with toast and sometimes Sauteed Mushrooms, but it is also a delicious meal on its own! It comes together pretty quickly and goes really nicely with a glass of dry red wine. 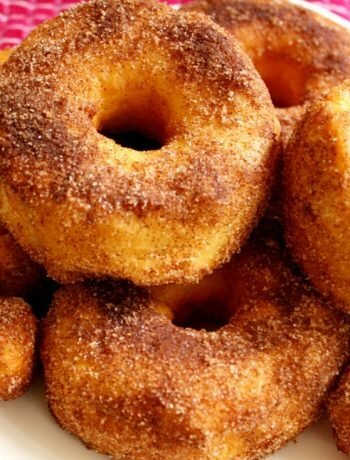 It would also be a lovely appetizer or even a tasty breakfast. Line a pan with foil (for easy clean up) and grease it with cooking spray. 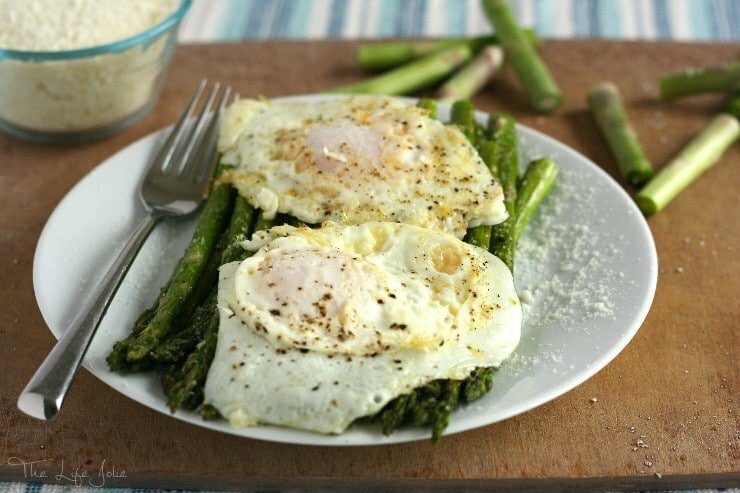 Spread your asparagus into a single layer on your pan. Drizzle with olive oil and season generously with salt, pepper and cheese. Roast of 15-20 minutes (depending on the thickness of the asparagus) or until fork tender. The tops will be a bit brown without being burned. 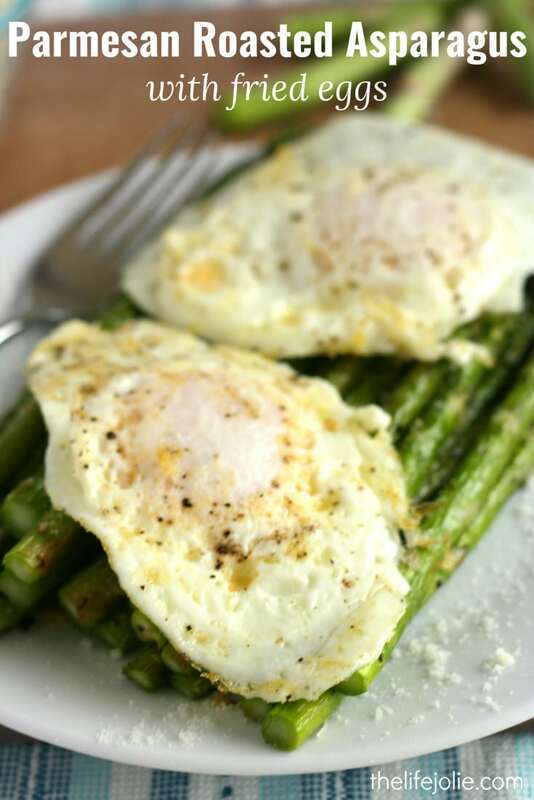 While the asparagus roasts, fry your eggs to your preferred level of doneness (I enjoy over easy so that it’s just done enough for the whites to be cooked through with the yokes still runny). Season with salt and pepper to taste. 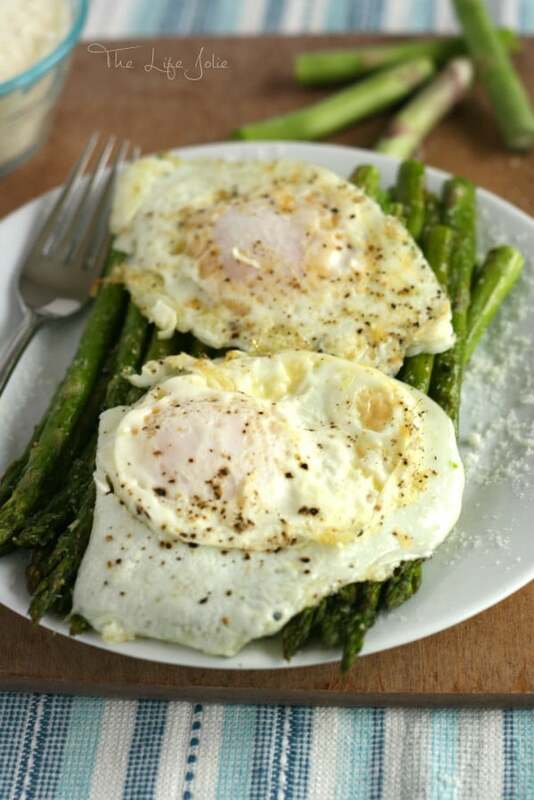 When the asparagus is done, transfer it to a plate and top it with your eggs. If you’re feeling frisky, add another sprinkle of cheese and dig in while it’s still hot. April 12, 2016 at 2:10 pm I just used up some fresh asparagus the other day. Darn I wish I'd seen the recipe so I could try it. I'll keep it for the next time.